Did you know that there are approximately 50 million plastic bottles thrown in the trash every year? That’s in the United States alone. Imagine what that number is when you take into account every household in the world. Plastic bottles are found in probably every household in the world and you’re sure to have at least one or two empty ones right now. 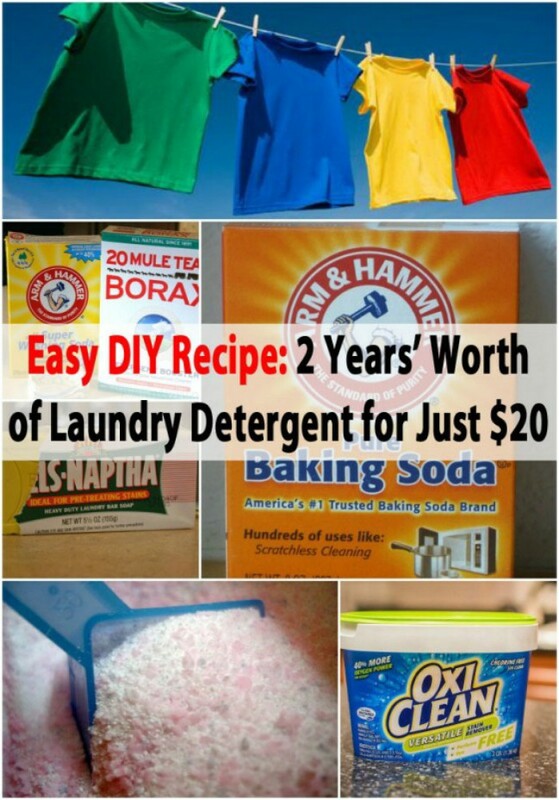 To help combat the number of bottles thrown out every year, and for a little DIY upcycling fun, I’ve found 20 great ways that you can repurpose empty laundry detergent bottles. Whether you want to save the environment or save money, these projects are perfect. 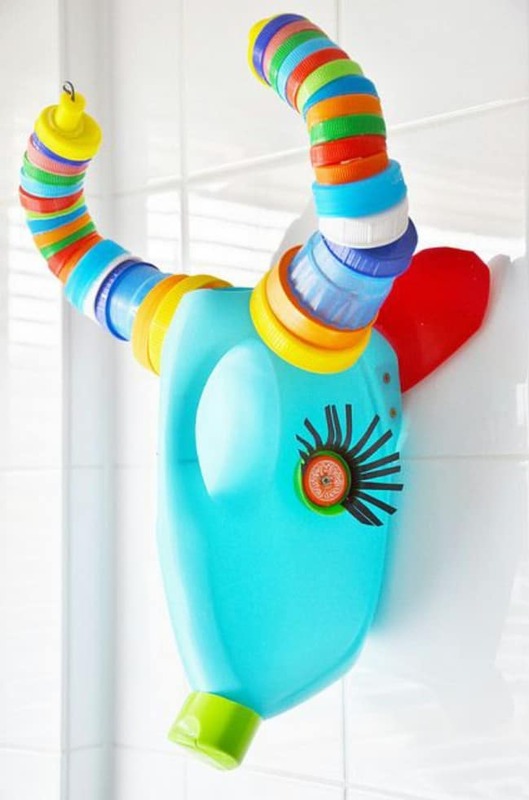 You’ll find everything in here from great toys for the kids to beautiful garden light decorations and even bird feeders – all made from those empty laundry detergent bottles. You’re sure to go through at least one bottle a month – at least we do in my house – which means you’re throwing out 10 or more of these bottles every year. You know how much I love to upcycle. I mean, just check out these 20 genius ways to upcycle empty tuna cans. If there’s a way to reuse it, I’m going to find it. From dollhouses and adorable kid’s room décor to book stands, magazine racks and tool shed storage, there are wonderful ways for you to upcycle those empty bottles and help to save the environment. Plus, you save money on the things that you would need to buy if you didn’t DIY them, right? So these projects really are a win-win for everyone. I love a good DIY project, particularly when it lets me save money and if I can help to save the environment at the same time then I consider that a real winner. I’ve done a lot of repurposing projects lately because they’re my absolute favorite. Just take a look at these 25 wonderful ways to repurpose old pots and pans. There really is a way to turn trash into treasure in just about every aspect. So, we’re going to look at some cute ways that you can repurpose those empty laundry detergent bottles and save money – as well as the earth itself. If you’ve ever wanted to know what you could possibly do with those empty bottles, this is definitely the project for you. 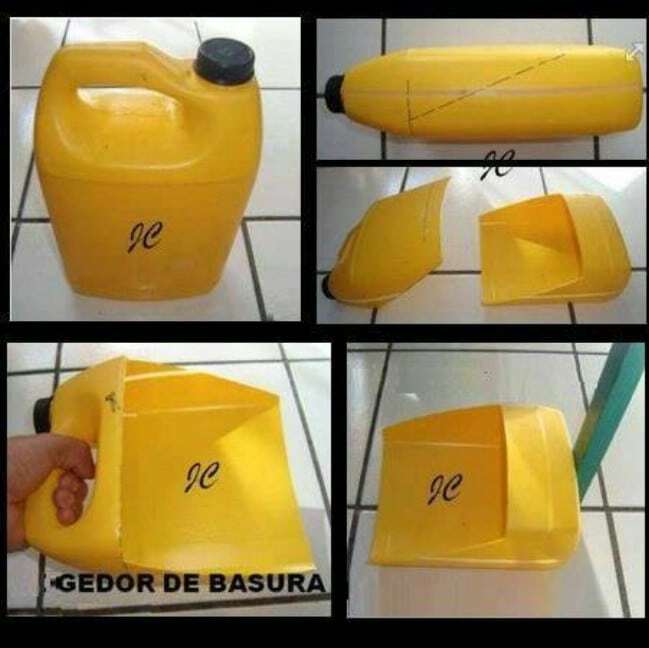 I hope you find it as useful as I have and I hope you’ll share your favorite laundry detergent bottle upcycling project. Those empty laundry detergent bottles are the perfect shape for this great ball and cup game. Just clean them up, cut the side out – leaving the handle intact – and get a ball. Kids are going to adore playing with these and it’s the perfect outdoor game for spring and summer to get the kids out of the house and on their feet. 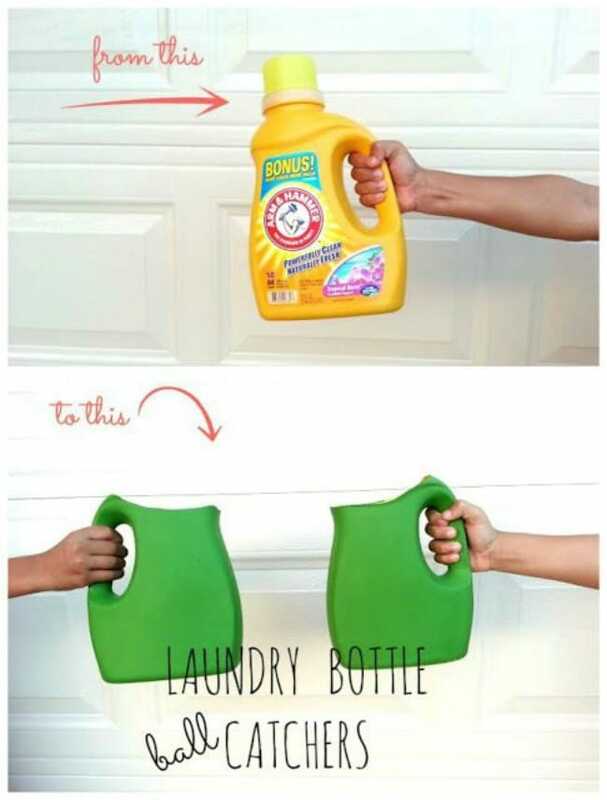 You can also turn those empty detergent bottles into beach buckets. If you’re planning a beach vacation – or you’re lucky enough to live near the coast – this is a great way to get the kids a bucket without spending money. Since they’re made from something you would probably throw out anyway, it doesn’t really matter if they break them or forget them at the beach. Just cut away the top and you have the perfect scoopable sand bucket for hours of beach fun. Clean up that empty laundry detergent bottle, paint or decorate it if you want and then cut a hole in the center of the front. Here, you can put bird feed and little birds can easily get to their dinner. The jug itself is large enough for smaller birds to climb right into so they can enjoy their meal out of the rain and bright sunlight. You can then just place your bird feeder on the porch or hang it from a tree. Don’t forget to add a dowel or wooden pencil for a perch. 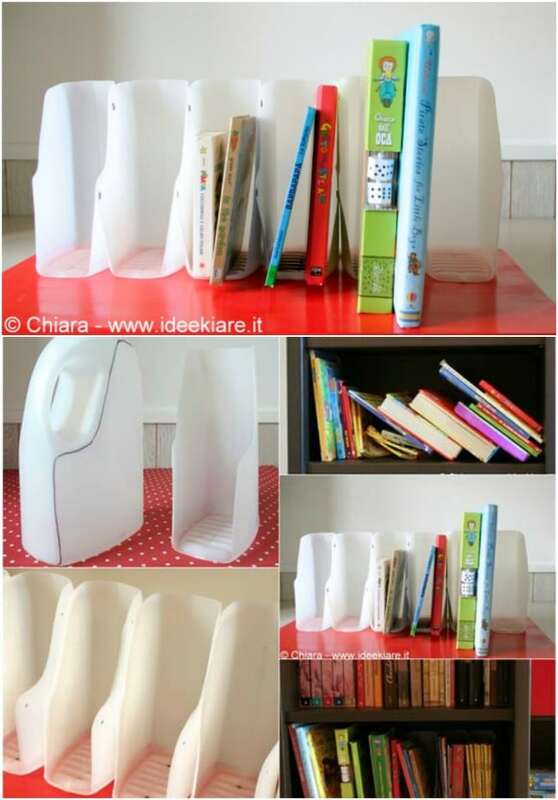 You can upcycle those empty detergent bottles and make these amazing book organizers. Instead of spending a few dollars each for these organizers at the store, just make them yourself, and once you clean up and shape your detergent bottle, you can paint or otherwise decorate it to match your existing office decor. They’re perfect for keeping books and file folders perfectly organized and aligned. Book stands come in really handy when you need to type and look at a book at the same time. Remember those old typing books from typing class that stood up on their own? 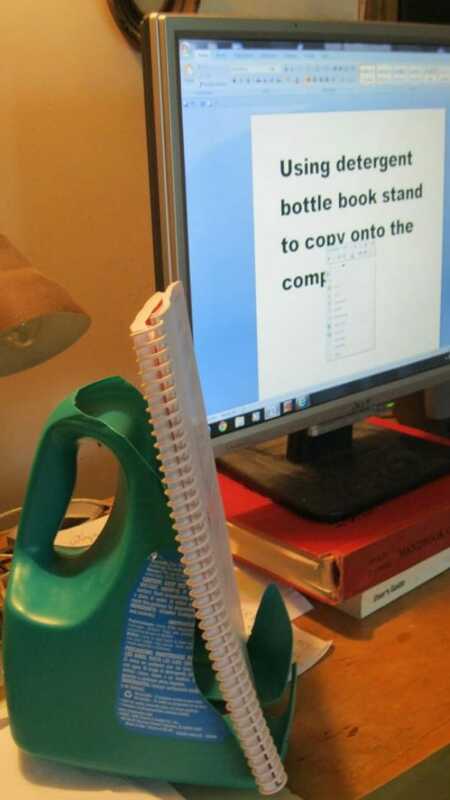 This book stand that you make from an empty detergent bottle follows the same principle. You just cut away the front of the bottle and books or folders will sit perfectly in the open space. Typing from a notebook or book will be a breeze with this stand! Summer is nearly here which means outdoor play – my favorite time of the year. It also means that little ones are bound to be going through tons of bubbles. That empty laundry detergent bottle will make an excellent refiling station for bubbles. The spout makes it easy to fill up smaller bubble bottles without making a mess so kids can keep their own bubble bottles full. 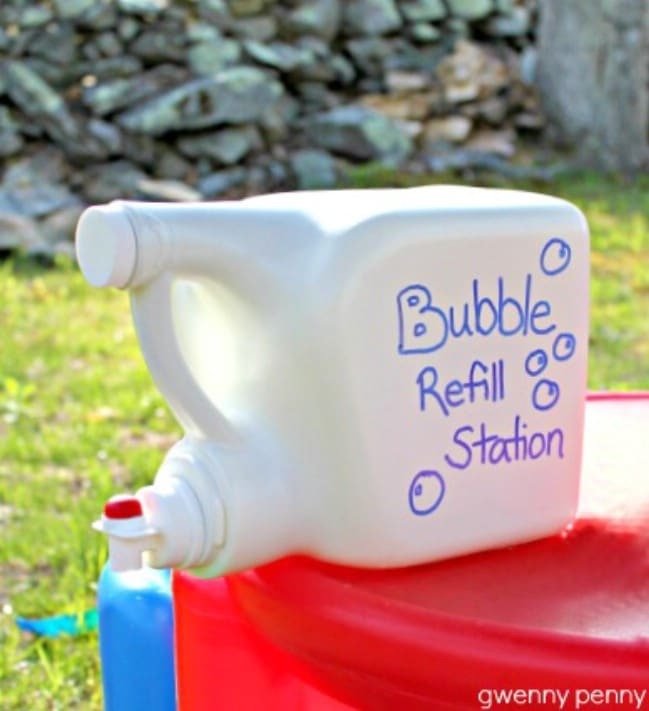 Plus, you can make your own bubble solution to go along with your bubble station – there’s a recipe for that, too. Let your little one feel as if they’ve conquered all of the big animals in the jungle with these cute little faux trophy animal heads. You make the heads from empty laundry detergent bottles and decorate with colorful bottle caps and other supplies. You can make every big game animal in the jungle with a little creativity and imagination and really give that room a makeover. How adorable are these little dollhouses? 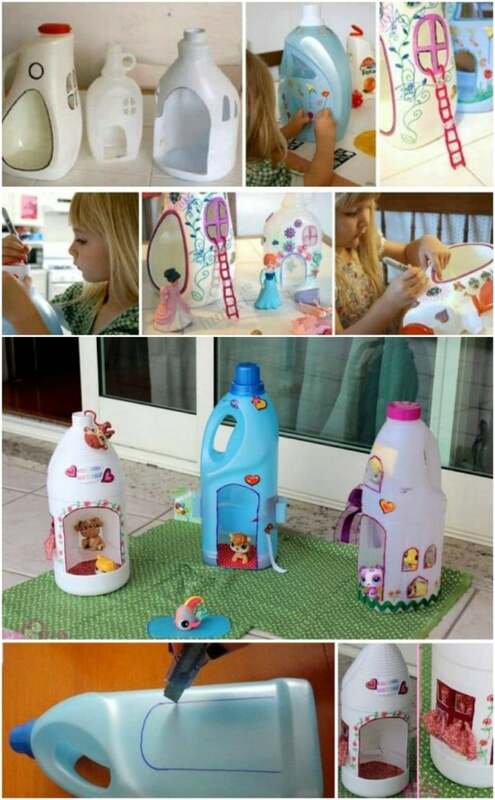 You make them from empty laundry detergent bottles and they are perfect for little girls who love playing with dolls. They’re also cheap and easy to make. Just cut away a section for the opening and she can play to her little heart’s content. The handle makes it really easy to tote the dollhouse around – you could also do this for a fairy house and decorate your garden! This upcycled dustpan project is great. I can never keep up with my dustpan and every time I have to buy a new one, I think that there has to be an easier and cheaper way to keep these things on hand. Well, if you cut a laundry detergent bottle just right, it makes a wonderful dustpan. This is perfect for when you’ve broken yours or just can’t find it. 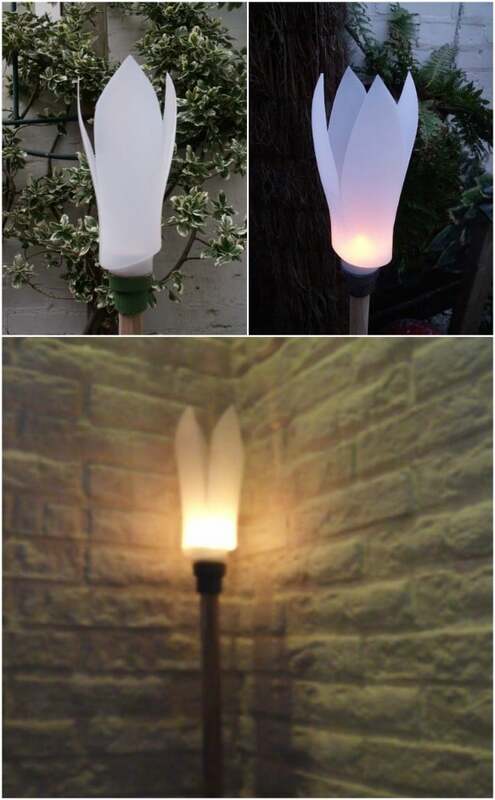 Believe it or not, this gorgeous garden light is made from an old detergent bottle that you cut to resemble an elegant flower. You don’t really need a lot of materials to make this and most of the things used are upcycled, so it’s a free project if you have a couple of basic things on hand. The finished product is beautiful and would be a great complement to your backyard patio. You don’t have to spend money buying a watering can for your garden. Although designed ones are really cool, you can get the same watering effect from an empty laundry detergent bottle. Just be sure to clean the bottle well to remove any soap residue and then cut holes in the cap for watering. It works like a charm and if you really want the design, you can dress up the bottle before you use it. You don’t have to go to the gym to get fit just as you don’t have to spend a lot of money on fitness equipment either. You can turn a laundry detergent bottle into a great kettlebell for weightlifting that will help to tone those arms and shoulders. Either use a laundry detergent bottle that is full or if you have a couple of empty ones, clean them up and then just fill with water. This gives you a great workout and without the cost of gym equipment. 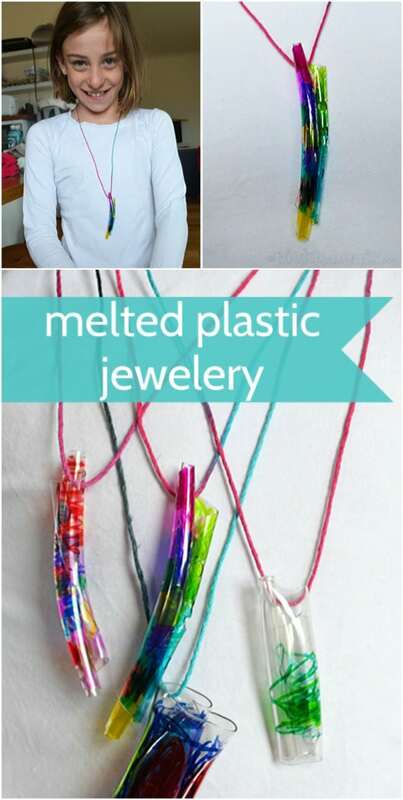 Repurpose that empty laundry detergent bottle into beautiful jewelry. You just cut the bottle into whatever shapes you want, let the kids get to town coloring or otherwise designing them and then heat them like you do for Shrinky Dinks. They turn into beautiful jewelry pieces that you can use for necklaces or earrings. This is a great idea for an upcoming birthday party for little girls or tweens. Let them make their own jewelry to take home as a party favor. 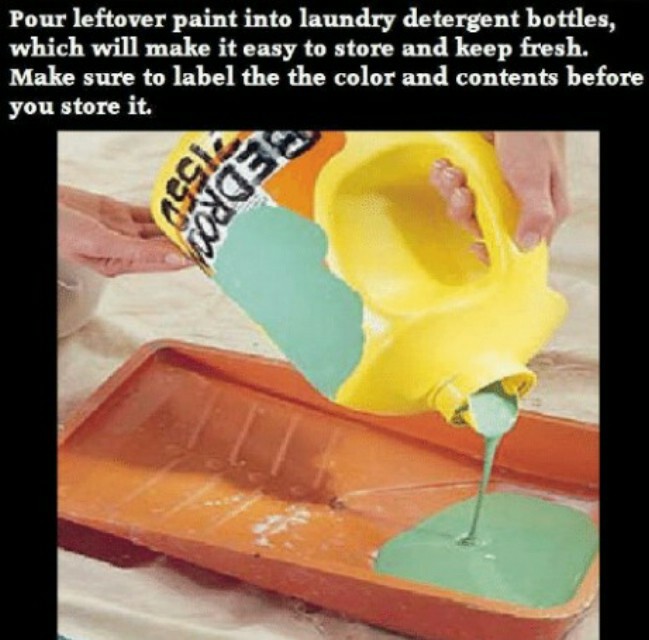 Turn those empty laundry detergent bottles into cheap and convenient leftover paint storage containers. Not only will the bottles keep your paint fresh, they make it much easier for you to pour paint into drip trays without making a mess. You could do this for any type of paint from exterior house paint to any number of craft paints that you may use. Plus, the bottles close up tightly so there’s no worry of leaks and spills while they’re being stored. 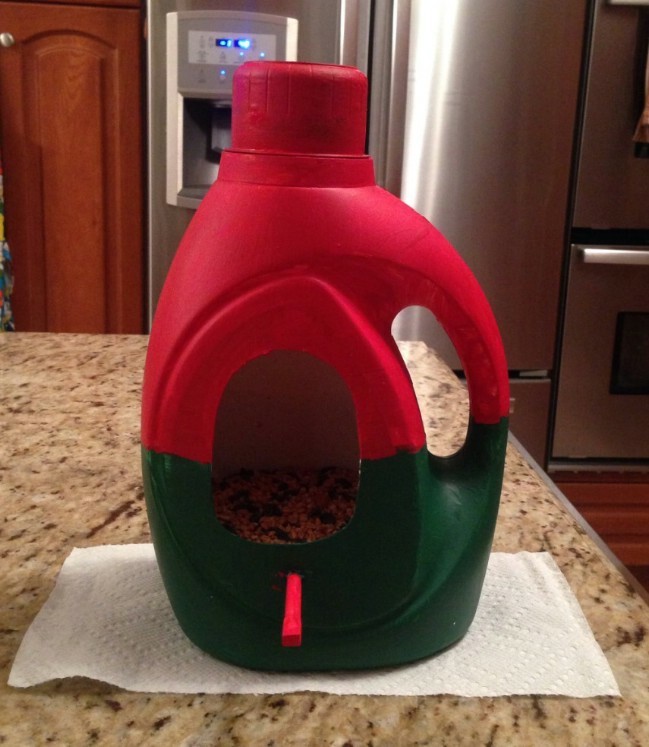 You can turn that empty detergent bottle into a great scoop for pet food. Just clean it well and cut off the top, leaving the handle intact. 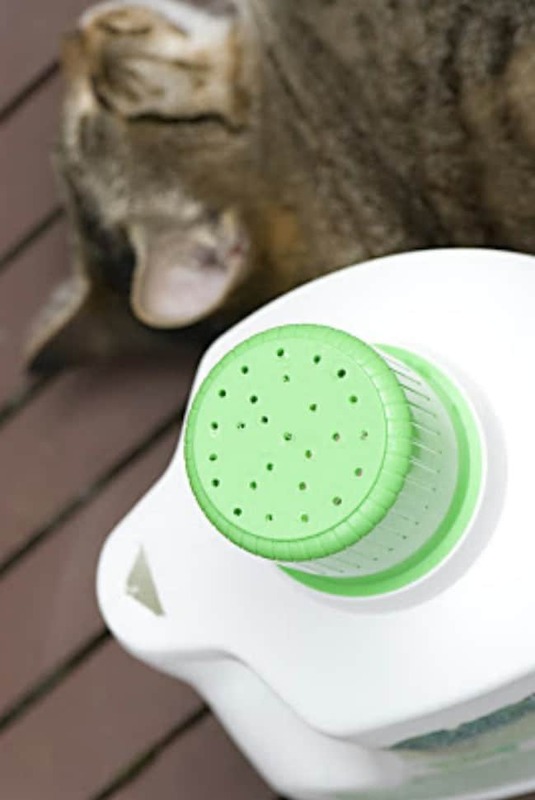 This is great if you have a lot of dogs and cats to feed or it works great for larger pets, too. Just be sure to wash it well so that you remove all of the detergent before you feed with it. 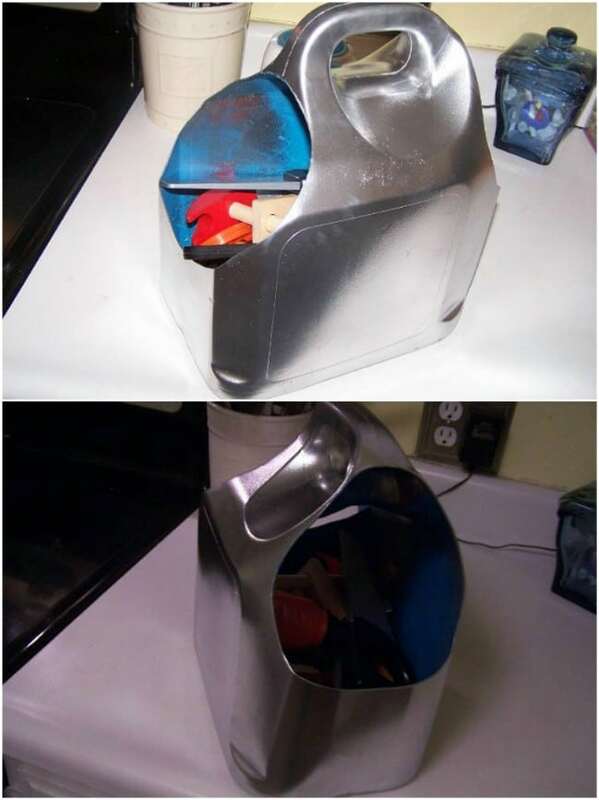 I loved making piggy banks from all sorts of things when my kids were younger. This upcycled laundry detergent bottle turned piggy bank will hold loads of coins and cash and it’s a really easy project. Kids are going to love decorating their banks and the lid serves as an easy way to get that cash out when they want to spend it. Let them be as creative as they want to be – the more they design it the more likely they are to want to keep their money in it. If all else fails and you just really can’t think of anything that you want to make with those empty detergent bottles, why not use them to store your homemade laundry detergent. Homemade detergent is quick and easy to make up and it saves you a ton of money over the course of a year. Imagine never having to worry about buying laundry soap and you can use those bottles that you already have on hand to store your homemade soap – so you always know what’s in there. I love the idea of turning that detergent bottle into a toilet brush holder. If you need a holder for that toilet scrubber, what better way to get one than to upcycle an empty bottle? The lid – half of it anyway – helps to keep the brush standing upright and the handle is great for when you need to pull it out to clean it. This is such a quick and easy project and one that will save you a little money over buying a new holder. 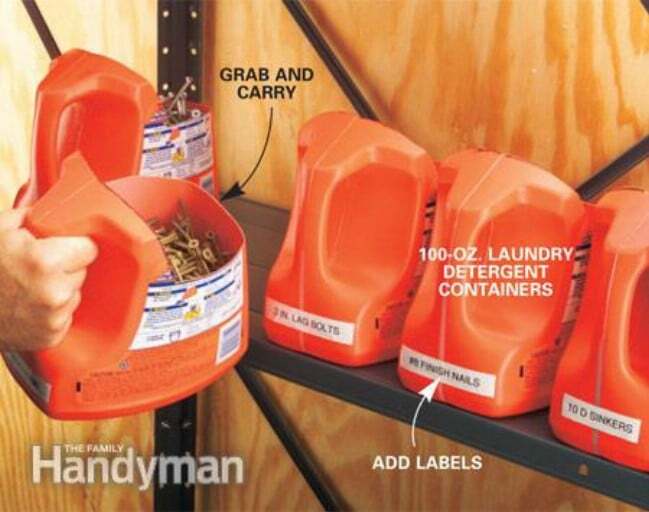 Those empty detergent bottles make excellent storage for nails, screws, and just about anything else you may have in your tool shed. Just cut away a section from the front and leave the handle intact. This makes it so much easier to grab the containers and pull them out as you need them. Add labels just under the handles so that you know what’s inside and leave the handles facing outward for easy grab and go when you’re working on a project. 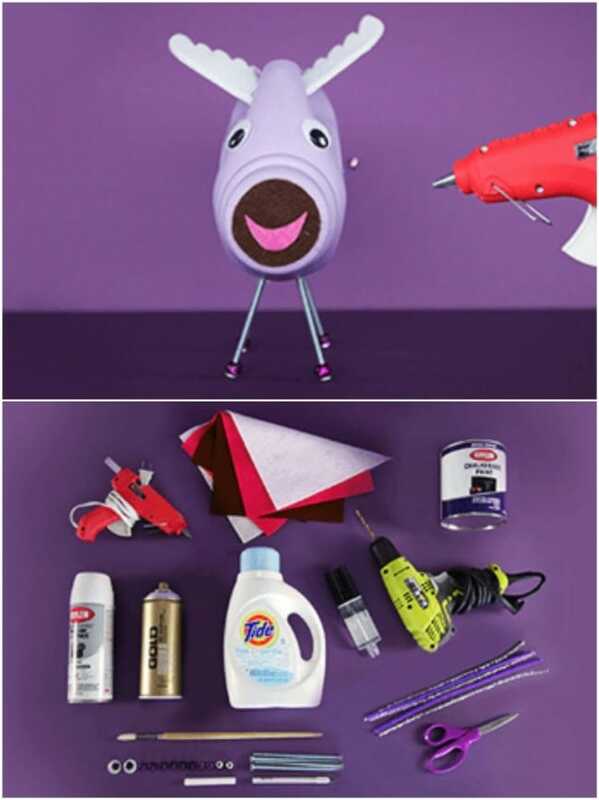 Turn an empty laundry detergent bottle into an adorable little toy toolbox for your little one. This is one of the cutest projects that I’ve ever seen and it’s so easy. 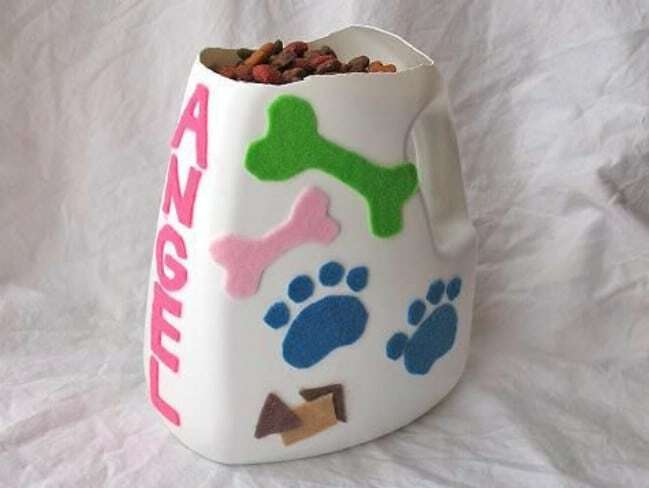 You just cut the spout section out of a large detergent bottle and then maybe paint the entire bottle to match your little one’s tool shed – or whatever they use as a makeshift toolshed, or even their favorite name brand. The larger bottles hold so many little tools and the bottle itself is lightweight so it will be easy for him to carry around his tools of the trade. all ideas wonderful except for pet food one. Plastic breeds bacteria at an alarming rate. The idea of using glass, metal, or ceramic ONLY to house or distribute pet food has been known for years but animal lovers everywhere continue to educate folks.